Classical antiquity (also the classical era, classical period or classical age) is a broad term for a long period of cultural history centered on the Mediterranean Sea, comprising the interlocking civilizations of ancient Greece and ancient Rome, collectively known as the Greco-Roman world. 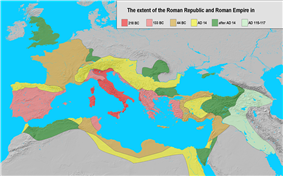 It is the period in which Greek and Roman society flourished and wielded great influence throughout Europe, North Africa and Southwestern Asia. Conventionally, it is taken to begin with the earliest-recorded Epic Greek poetry of Homer (8th–7th century BC), and continues through the emergence of Christianity and the decline of the Roman Empire (5th century AD). It ends with the dissolution of classical culture at the close of Late Antiquity (300–600), blending into the Early Middle Ages (600–1000). Such a wide sampling of history and territory covers many disparate cultures and periods. "Classical antiquity" may refer also to an idealised vision among later people of what was, in Edgar Allan Poe's words, "the glory that was Greece, and the grandeur that was Rome." The culture of the ancient Greeks, together with some influences from the ancient Near East, prevailed throughout classical antiquity as the basis of art,  philosophy, society, and educational ideals. These ideals were preserved, imitated and spread over Europe by the Romans. This Greco-Roman cultural foundation has been immensely influential on the language, politics, educational systems, philosophy, science, art, and architecture of the modern world: From the surviving fragments of classical antiquity, a revival movement was gradually formed from the 14th century onwards which came to be known later in Europe as the Renaissance, and again resurgent during various neo-classical revivals in the 18th and 19th centuries. The Phoenicians originally expanded from Levantine ports, by the 8th century dominating trade in the Mediterranean. 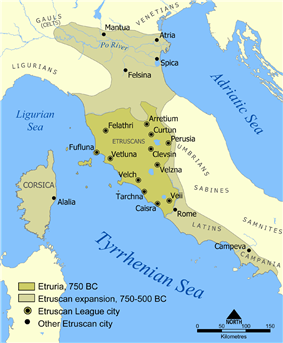 Carthage was founded in 814 BC, and the Carthaginians by 700 BC had firmly established strongholds in Sicily, Italy and Sardinia, which created conflicts of interest with Etruria. Many individuals have attempted to put a specific date on the symbolic "end" of antiquity with the most prominent dates being the deposing of the last Western Roman Emperor in 476, the closing of the last Platonic Academy in Athens by the Eastern Roman Emperor Justinian I in 529, and the conquest of much of the Mediterranean by the new Muslim faith from 634-718. These Muslim conquests, of Syria (637), Egypt (639), Cyprus (654), North Africa (665), Spain (718), Crete (820), and Sicily (827), (and the sieges of the Eastern Roman capital, First Arab Siege of Constantinople (674–78) and Second Arab Siege of Constantinople (717–18)) severed the economic, cultural, and political links that had traditionally united the classical cultures around the Mediterranean, ending antiquity, see (Pirenne Thesis). ^ Hadas, Moses (1950). 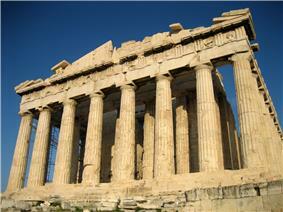 A History of Greek Literature. Columbia University Press. p. 327.